>> by the bridge bottleneck? > Would it, as its multiplexed? I think so, as I doubt that multiplexing reduces the nominal bandwidth by more than 50%. There are 4 input lanes to the bridge, so using x2 bandwidth for a SATA3 card in the x4 slot leaves another x2 bandwidth for the remaining two x1 slots and the PCI bridge with two PCI slots. This means that using further cards in the two x1 slots (or in one x1 slot and one or two PCI slots) would be within the bandwidth of the PCI controller and the SATA3 card wouldn't be slowed down. Just when the two x1 slots *and* one or two PCI slots are occupied by cards, the 4 input lanes have to be multiplexed to more than 4 output lanes, so bandwidth would likely not be enough to sustain full SATA3 speed anymore. > I just did a quick comparison between the P1022 and the T1042's SerDes I/O lines. The P1022 on the Tabor/A1222 riddles me. A-Eon claims one PCIe x16 slot with x4 bandwidth for Tabor. If we look at the possible SerDes configurations for the P1022, we can see that the most sane configurations for PCIe that allow both SATA and Ethernet are x1 x1 x1 (0x06) and x2 (0x0e). This means the x16 slot could have x2 bandwidth at best, not x4. The only option that provides x4 bandwidth for one PCIe controller would be x4 x2 (0x1c), but this lacks both SATA and Ethernet. Even if we assume that assignment of the P1022's 6 SerDes lanes was completely arbitrary and not restricted by predefined configurations, PCIe x4 + 2x SATA + GbE would obviously require 7 SerDes lanes. Something seems not right here. Any ideas? 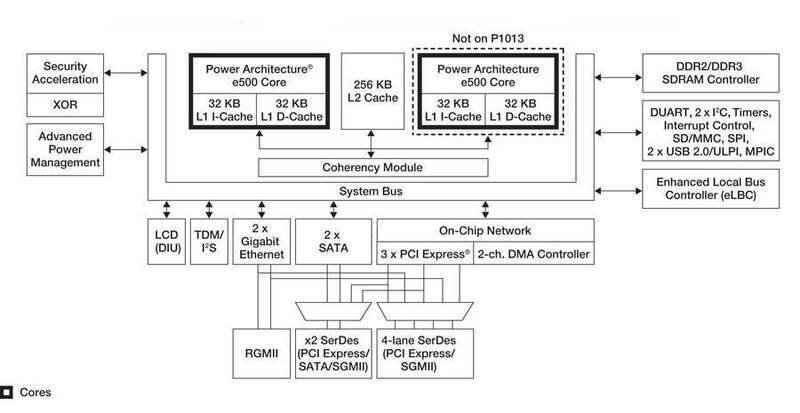 If we look at the possible SerDes configurations (or there, page 37) for the T1042, we see that the most sane configuration is 0x08 with x4 x1 x1 for PCIe, also providing 2x SATA as well as Ethernet (via "Parallel Port"). ...of which max. 8 can be assigned to PCIe. The T4240RDB has one x8 slot and one x4 slot (both at 5 GHz / PCIe v2), so only 50% of slots, 37.5% of PCIe lanes and 75% of PCIe bandwidth. The T4240QDS, which has up to four x4 slots and thus 100% of slots, has only 50% of PCIe lanes but 125% of PCIe bandwidth. > the T4240 has 32 SerDes lanes at 10 GHz. ...of which max. 16 can be assigned to PCIe (twelve at 5 GHz / PCIe v2, four at 10 GHz / PCIe v3). >>>> even if it was somehow limited to x2 speed by the bridge bottleneck? >>> X5000's x4 slot is blocked by any video card wider than single slot. >> so this doesn't render my questions invalid. > I was not trying to render your question invalid . What were you trying to do then by giving that reply? Where's the connection to my specific questions? I already linked to the PCIe-PCIe bridge two weeks ago. Can you quote the information from the datasheet that answers my specific questions? Again, what has the PCIe-PCI bridge to do with my questions? > Still, really f'ing neat stuff. Thanks Spectre. > Does Tabor use anything like this first bridge? > I would certainly help, considering the limited number of SerDes lanes. I don't think so as it has just one PCIe slot and apparently no other on-board components connected to PCIe. I was raising a point based on the the models of video card that Jim talks about using so that reply was really pointed in his direction . I am looking at a page from the Cyrus Technical Reference Manual. I am not an engineer so somebody correct me if I am going wrong. The 1 x PCIex4 ,3 x PCIex1 connect through 4 lanes of the P5020/P5040 via the 89H12NT12G2 PCIex-PCIE switch and the 2 PCI slots connect to the 89H12NT12G2 via the PI7C9X111SL PCIE-PCI so if I understand correctly everything is going to pass through 4 lanes to the cpu . What would the impact of say transferring data from a drive attached to a pciex4 sata 3 card to a drive attached to a pciex1 sata 2 card while playing audio from internet radio with a PCI based network card and pciex1 Audio card ? If you transfer via the pciex4 to the onboard sata no problem ? or if you do the internet radio and transfer from the pciex1 to the onboard sata also no problem ? . Mmm, since they're almost ready, how about the X5000 port and the 11,2 port, and then let's hit the road running for X64 (Ryzen maybe). 'Cause its not getting just crazy around here, its getting STUPID. And I have some tolerance for crazy, but stupid is just plain irritating. Yeah, I'd be for it. It takes some work to set it up for Linux. Your easiest course if you want AMD graphics is one of those Apple X1900GT everyone keeps saying aren't available (although on any given day I can usually find listings for two or three of them). If its the water cooled quad, get a t-handled hex wrench, pull them cpus and rebuild the cooler. If not you're probably good for another 12 years if you just blow out the dust. BTW - How much did it set you back? It's explicitly meant for MorphOS. If support for it doesn't come with 3.10 I'll sell it, or I'll keep it with macOS Leopard for my daughter. Probably I paid a little too much, ~100. But it's it good shape, clean, no scratches, etc. From what I know the support won't come with 3.10 (if at all). It's way behind schedule to delay it even more (and supporting the PCIe G5's would mean a further delay for the team). X5000 would not boot even with just the adapter and no video card attached with the primary card in the pciex16 slot. >> What were you trying to do then by giving that reply? >> Where's the connection to my specific questions? > talks about using so that reply was really pointed in his direction . > if I understand correctly everything is going to pass through 4 lanes to the cpu . > audio from internet radio with a PCI based network card and pciex1 Audio card ? As I wrote in comment #40, I *think* that the bridge and the SATA3 card could negotiate to use only 2 of the 4 connected lanes, which would still be 67% more bandwidth than required for full-speed SATA3. In your scenario, this would leave x2 bandwidth for the x1 SATA2 card, the x1 audio card and the x1 PCI bridge (with the NIC). This means that the 4 input lanes would have to be multiplexed to 5 output lanes, so bandwidth would likely not be enough to sustain full speed for all cards anymore. I don't know what would happen, but I can imagine that the x2 connection between bridge and SATA3 card would be re-negotiated to x1, resulting in reduction to 83% SATA3 speed, but freeing one more lane so that there are 3 lanes for the other three cards connected by x1. > internet radio and transfer from the pciex1 to the onboard sata also no problem ? . Did not see post #40 when I was typing what became post #43. Was looking at the reference manual page so took my time before pressing submit. Sorry also was not following the bridge info in the earlier part of the thread . > but the X5000 would not boot any of the combinations that I tried. > and no video card attached with the primary card in the pciex16 slot. That's strange as such adapter should be just a dumb extension of the x1 connector (and the other lanes electrically dead or not even there). Yeah. This was a highly speculative task to buy this thing. Probably a bit passion driven in the hopes that 3.10 would add support for it. Well, I don't see this happening (G5 support) in the next release alongsidr X5000 support (IF we even get that). And 3.11 is likely to be a 'bug fix' release. Also, they have not stated that support for the 11,2 was even under consideration. I bought mine to run Linux, to have something to compare the X5000 to, because it's about the best PPC system released for single user applications, and on the off chance the support might happen. But if it doesn't, I still have a competent PPC Linux system. I don't know personally how valid the complaints about the X5000 are, but the expansion bus of the 970MP has a LOT of PCI-E lanes. > the expansion bus of the 970MP has a LOT of PCI-E lanes. The PPC970MP provides no PCIe at all, but connects via Elastic Interface to the IBM CPC945 (aka Apple "U4"), which in turn connects via HyperTransport to the ServerWorks HT-2000 (aka Broadcom BCM5780). The 16 lanes for the x16 slot are provided by the CPC945/U4, while the other 16 lanes for the x8 slot and the two x4 slots are provided by the HT-2000/BCM5780. There's an "IF"? You mean there is any substance to what KennyR claimed a year ago? Cool, I never really researched that, but it makes sense since the 970 isn't really a SOC. Thanks for all the documentation. And, btw, no there is no indication from anyone that those assertions by KennyR are correct. The only reason I have heard for the delays related to 3.10 revolve around the code that had to be replaced. > the 970 isn't really a SOC. 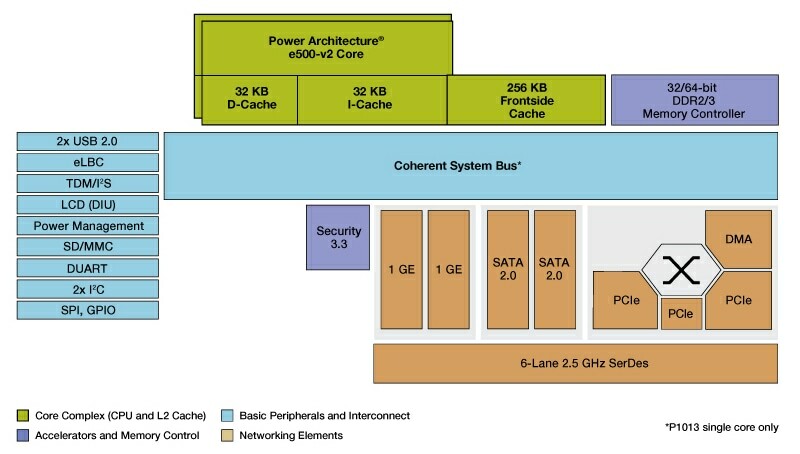 Yes, it's no SoC at all, not even a very basic one like the PA6T with its integrated memory controller (and Ethernet). > Hyper Transport...like AMD uses. Yes, and HyperTransport is already used by the CPC925/U3/U3H to connect to the PCI(-X) bridge in the currently supported AGP-based G5 PowerMacs. > the code that had to be replaced. Cool, and I used to know who invented Hyper Transport, but my memory isn't as strong as yours (which is why I mentioned AMD, but to the best of my knowledge, they are only a licensee). These new APUs will make a great addition to AMD's lineup. Ryzen only just competes with Intel's line up, but AMD's graphics are much better than Intels built in gpus. Did I misspell 'IF', wouldn't surprise me. > but to the best of my knowledge, they are only a licensee). I'm not sure who invented it, but it was introduced in 2001 by the HyperTransport Consortium "founded in 2001 by Advanced Micro Devices, Alliance Semiconductor, Apple Computer, Broadcom Corporation, Cisco Systems, NVIDIA, PMC-Sierra, Sun Microsystems, and Transmeta". > in October 1000 new AmigaOne A1222 boards will be released to the community. Hasn't this already been postponed to early 2018? They must be 3 years old by then. I wouldn't find it fair to charge them more than Sam460 user (49 EUR). by the end of 2017. If I can find anything more recent from the source, I'll post it. I promised to post anything new mentioned on this topic. Although not earth shattering, here it is. Although there is still some work needed to done on audio and Ethernet drivers before the AmigaOne A1222 can be commercially released, the FPU optimization appears to be progressing well. Nevertheless, apparently they are taking it to AmiWest and intend to do a demo. the plan is to show AmigaOS 4.1 running on the AmigaOne A1222 in a live public demonstration for the first time. It was originally developed by AMD/DEC. Thanks, I knew AMD was a significant player in this, I just didn't realize that they were that big a part of it. > AMD's graphics are much better than Intels built in gpus. Hmm, I never would have predicted that. Looks like a bad decision on AMD's part as it could damage their future growth in laptops once the Ryzen based APUs hit. Then again, US companies have always foresaken long term goals for short term profit. And maybe I'll be using more Intel CPUs in the future (which might have happened anyway as I prefer discrete graphics cards). > obviously require 7 SerDes lanes. Something seems not right here. Any ideas? Mystery solved, and the solution is foreheadslappingly easy: Just as with the newer T1022/T1042, the P1022 does not require any SerDes lanes for the GbE controller if in RGMII mode. What had me confused was the simplified P1022 block diagram which implies that the GbE controllers would only work with SerDes lanes assigned to them. 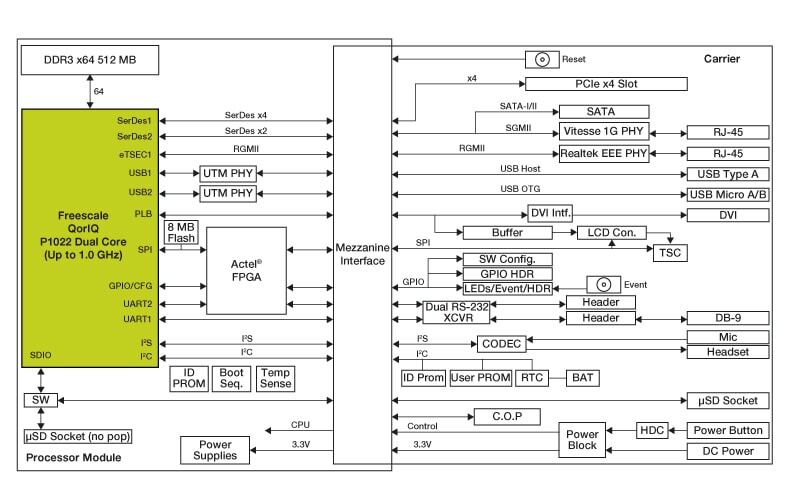 Looking at a more detailed P1022 block diagram reveals that the SerDes lanes of the P1022 are assignable to SGMII-mode GbE, but not to RGMII-mode GbE (which is what is used on A1222/Tabor). The block diagrams of the P1022RDK board and the P1022DS board also illustrate this. So in conclusion, the 6 SerDes lanes of the P1022 supply the PCIe slot with 4 lanes and the two SATA2 ports with 1 lane each, and GbE is provided by the eTSEC/VeTSEC in RGMII mode.